The articles on this page will help you clean and clean up your household. The kitchen and kitchen stairs ensure that you can easily access anywhere, even if it is just too high for you. Handy if you are going to patch the windows or replace a lamp. 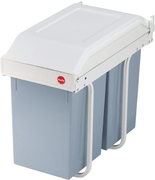 The waste bins, ranging from paper bin to outside waste bin, ensure that your environment stays neat and tidy. And with the vacuum cleaners you keep your floor and house tidy and fresh. Not such a household type? Frank has handy aids that make organizing the household just a bit easier.